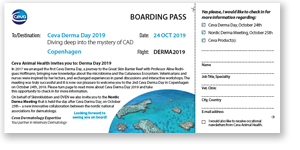 In 2017 we arranged the first Ceva Derma Day, a journey to the Great Skin Barrier Reef with Professor Aline Rodrigues Hoffmann, bringing new knowledge about the microbiome and the Cutaneous Ecosystem. It is now our pleasure to welcome you to the 2nd Ceva Derma Day in Copenhagen on October 24th, 2019. Canine Atopic Dermatitis (CAD) is common, lifelong and often difficult to manage. Fortunately, better research and knowledge about the underlying causes have led to new approaches and treatment options. This is encouraging for the treating veterinarian, the patient and the owners. At the same time, it is a challenge to stay updated! The management of CAD involves ongoing tailored treatment that requires a flexible mindset over time. For example, how does the age of the dog affect the treatment? What is the best way to combine treatments? When are the different anti-inflammatory and antipruritic drugs used? What do we do when treatment fails? How do we improve quality of life for atopic dogs and their owners? There are many factors to consider, which require knowledge, experience, dedication and persistence by the veterinarian, nurse and pet owner. 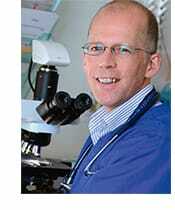 Tim Nuttall has over 20 years of experience in research, clinical trials and managing CAD. He is a member of theInternational Committee on Allergic Diseases in Animals (ICADA), and has worked on their CAD position papers and treatment guidelines. Ceva invites you to explore proactive management of this lifelong disease with him. On behalf of Skinnklubben and DVEN we also invite you to the Nordic Derma Meeting that is held the day after Ceva Derma Day, on October 25th – a new innovative collaboration between the nordic national.